Document Scanning Apps allows you to scan and share so many important documents and photos etc. directly on your Phone. With the help of these apps, text becomes more readable and mostly allows you to save documents as PDFs. However in the ancient era People did not keep safe own crucial documents still long time because their documents such as letter, invoice, registry paper, bank paper and other important documents use to get lost, fired, tear and misplaced. But in the digital world or modern age, we can keep our crucial documents safely for long time with the help of scanning apps. It is possible to scan paper-based items such as letters, receipts, invoice, bank paper and other documents by using the camera of your mobile device. You can scan your documents easily and share them over your mobile. You can keep your documents safe and stored on your phone for upcoming use. You can also use third party file scanning apps or document scanning apps to scan documents or files. Here are some of the Best document scanning apps 2019 that you can use on Android or IPhone. 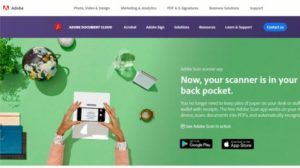 Adobe scan is a genuine and useful scanning app which developed by Adobe. It runs as an app on your android or iOS mobile phone. You can catch a copy of a document to convert into a PDF file. You can rotate, crop, edit and resize the documents preview. You can not only san into PDF Document format, but also edit, mark, sign and work collaboratively with the documents that you do scan. You can easily download this free app from Play store or Google Apps. Genius Scan is the most helpful and legitimate scanning app that changes paper-based documents into jpg and PDF files. It allow create digital copies of dozens of pages within seconds. It also improves the legibility of documents, and makes them readable. You can also keep your files organized with titles, and tags as well as you can upload scanned documents to a variety of cloud storage platforms such as Drop box, Expensify, Facebook, Google Drive, One Drive and others. Abby fine scanner is the most advance feature apps that uses optical character recognition to scan text in 193 languages. It is compatible with Android and IOS. This scan app can scan both printed and handwritten text. It works with 12 file format including DOCX and TXT. The main advance feature is that it reserves the original documents formatting. Moreover, It allows users to access a set of easy to use note tools to add signature and notes to text, as well as share it with friends over email or save it to cloud storage like as Dropbox, Evernote and ICloud. You can downloads this apps without paying no cost from Play store on Android or Google store on IOS devices. Cam Scanner is other useful tool to scan documents. With the help of this app you can scan a range of documents from invoices to receipts. This Software convert scanned documents in to PDF Files as well as save them automatically to cloud services such as Google Drive, One Drive, Evernote. It also comes with advance features which allow you add note and watermarks to documents and making them look more specialized. You can free download this app on Android and IOS Mobile Phone. Scanboot is a high quality scanner that allows you to easy and fast to create high quality scan on IPhone, IPad and Android. It is able to scanning hundreds of copies the documents accurately. With the help of this software you can easy scan documents, receipts, sketches whiteboard, business cards, QR codes and barcode etc. it also allows users to crop and optimize scanned documents as well as save them as PDF or JPG file. You can also upload scanned documents in to the Google Drive, ICloud,Dropbox, Evernote and other Cloud services. You can easily download these apps from Play Store or Google App Store. Office Lens is a genuine and useful photo scanner app which has been created by Microsoft. This app allows users to scanning photos, documents, business card, and Whiteboard. You can also shoot picture with the help of this app and save them in Gallery. It also provide the features you to add stickers, edit picture, add blur and even doodle over scanned documents and images. You can upload them to One Drive or Microsoft Office Suite of apps. Photomyne is the most useful scan apps that have been designed to scan photo, it allows you to click and organize your image in a single album and share then with you friends and relatives. It also provide the facilities to scan more than one images and rotate them when needed. You can use this app free for the first seven days. Doc Scanner is a scanner that integrates a QR Code generator, QR code reader, and OCR tool. It allows you to import images from the gallery. It also provide the facilities to edit the image to give it a scanned look and feel. It also allow you to add filters, watermarks, and Sticker. After scanned you can save the documents as PDF or image to your gallery or on the Google Dirve. Unfade Photo Scanner is the best app for Photo scanning but it is limited to IOS. It allow the recover colours of scanned photgraphs and carefully load them in folders and albums. Google Photo Scan is one of the best photo scanners that uses all corner images to improve the main image, Just place photo you need to scan in the given frame. The result is glare free scan even when you use the flashlight. This app comes pre-installed on most Android phone. Are you facing lots of problem I hope, the above Best document scanning apps 2019 help you to scan your documents as well as picture easily. You can download these apps absolutely free from Play store on Android or App Store on I phone.